Trent Mansfield of The First Tee of Chattanooga has been selected to attend The First Tee Perfect Sense Digital Pro-Am Challenge, set to begin Sunday at Congressional Country Club in Bethesda, Md. Trent, who’ll be a senior at Boyd-Buchanan this coming academic year, is one of 18 players from The First Tee East Territory chapters picked to play in the Congressional Pro-Am presented by Perfect Sense Digital. The June 22-27 event is in conjunction with the Quicken Loans National, an official PGA TOUR event to be played at Congressional. During Tuesday’s Pro-Am, the teens will play alongside PGA TOUR professionals, Special Olympics athletes, wounded veterans from the Troops First Foundation, and Perfect Sense Digital partners. The teens will also visit Perfect Sense Digital headquarters to meet with employees for an informal career fair, tour the U.S. Capitol and other educational sites in the Washington D.C area, and attend the first round of the Quicken Loans National. The Chattanooga Times Free Press made Mansfield a third-team Best of Preps Boys Golf pick in 2013. The local 2014 area tournament season got off to a great start this past weekend at Cleveland. Congratulations to Cody Godfrey on a great win. Hard and Fast. All golfers want the course to play hard and fast – until it actually does. The greens at Cleveland Country Club were in the best shape they have ever been for the invitational. Certainly no complaints this year about greens being too slow! Pin placements the front nine on Saturday were possibly a little too “aggressive” for the conditions, but simply challenging and fair for the next 27 holes. Scores on the rise. As a result of the hard and fast conditions scores were much higher than normal. The average score in the championship flight was 75.9474 on Saturday and 77.9474 on Sunday. Only three players shot under par on Sunday – Brandon Cissom (71), Keoni Vidrine (71), and David Weeks (71). Given the conditions, the fact that Cody Godfrey played the first 35 holes 6 under par was most impressive. Welcome to the back nine Mitch. Mitch Hufstetler made his debut over the weekend as a senior, and to no one’s surprise won the Senior Division. Mitch recorded a two-stroke victory (74-77-151) in spite of making a nine on the par-5 tenth hole on Sunday. Thanks for at least making it interesting Mitch. Great value for $135. PGA professional Lamar Mills and his staff always do an excellent job in conducting a first class event, and this year was no exception. Nice tee favors, great food for lunch both days, numerous prizes in all flights makes this event annually well worth the $135 entry fee. See you in two weeks at Signal Mountain. On Monday, April 28 six local pro shops will compete in a golf marathon at Cleveland Country Club to raise money for The First Tee of Chattanooga. Each team, using one player at a time, will see how many holes they can complete between 8:30 am and 6:30 pm. They have been raising pledges from club members for holes completed. Prizes awarded to the teams playing most holes completed, most money raised, most birdies made, best ringer score for the day. Look for updates throughout the day (@IfYouLikeGolf) on Twitter. Who will play the most holes? Who will raise the most money? Who will make the most birdies? How many birdies will that be? Who will shoot the best ringer score? What will that score be? Should be a fun day, and may thanks to all from The First Tee of Chattanooga that are making this day possible! If you would like to make a contribution to The First Tee of Chattanooga in honor of this day visit www.friendsofthefirstteechattanooga.org. FRANKLIN, Tenn. — In conjunction with its centennial anniversary, the Tennessee Golf Association has published Titans of the TGA: Fifty People Who Helped Shape The Tennessee Golf Association’s First Hundred Years. “Over the last hundred years, there have been numerous people who have made significant contributions to furthering the purposes of the Tennessee Golf Association, Women’s Tennessee Golf Association and amateur golf all across the state and we wanted to take this unique opportunity, with our centennial anniversary, to honor some of these people for their efforts,” stated TGA executive director Matt Vanderpool. The TGA selected fifty people, from varying backgrounds, to profile in Titans of the TGA. There are profiles on great players such as Dr. Cary Middlecoff, Lew Oehmig, Betty Probasco and Sarah LeBrun Ingram, along with various administrators who volunteered their time and resources to promote the game, and benefactors like Vince Gill, who Pro-Celebrity event, The Vinny, has raised millions of dollars for Tennessee junior golf and The Honors Course’s founder Jack Lupton, whose incredible gift allowed Golf House Tennessee to become a reality. Also included are profiles on golf course architects like Donald Ross, who designed some of the state’s greatest courses, golf professionals who were instrumental in forging a cooperative culture that Tennessee still benefits from today, and superintendents who have willingly shared their expertise with others to ensure golfers in Tennessee play on some of the best conditioned courses in the country. Titans of the TGA was the idea of author Chris Dortch, who spent the last six months conducting hours of research, interviewing hundreds of people, and ultimately writing a 75,000-word masterpiece that tells the story of these fifty people who made a significant impact on amateur golf in our state. Titans of the TGA is now available for sale through the TGA for $49.00 plus tax. Anyone interested in the book can download a sample story on Tennessee’s greatest golfer, Dr. Cary Middlecoff, and purchase copies at www.titansofthetga.com. Proceeds from the sales of this commemorative book will go back to the TGA and help ensure that the game of golf in Tennessee remains healthy for future generations. The book will also be on sale during a special centennial dinner at Chattanooga Golf and Country Club on March 29. Tickets are available by contacting Golf House Tennessee at 615-790-7600. In 1914, the Tennessee Golf Association (TGA) was organized at Memphis Country Club as an association of private clubs. 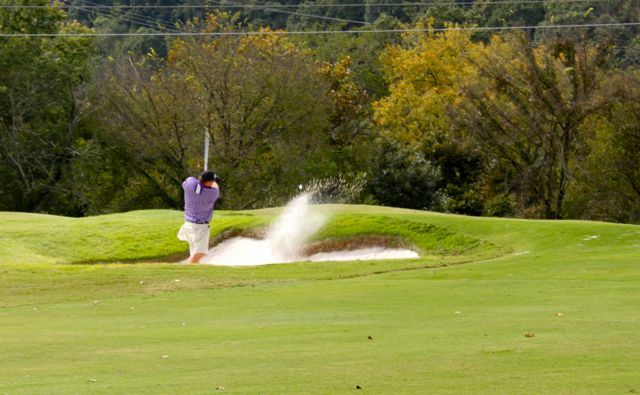 The objective of the Association, as stated in its Constitution, “shall be to promote the game of golf in Tennessee.” From these small origins, the TGA has become an association which now includes over 200 member clubs, courses and organizations, comprised of over 32,000 individuals from across the state. For more information on the TGA, visit us online at tngolf.org. The First Tee of Chattanooga would like to give all area golfers a unique opportunity to say “thank you” to the PGA professional or pro shop staff that serves you on a daily basis. During “Dinner with Dottie” on Friday, October 18 at CGCC we will be announcing a pro shop staff to be treated to dinner provided by Ruth’s Chris Steak House in Chattanooga. Which staff is announced as the winner is up to you! If you would like to say “thank you” and help your staff win a grand prize of an evening provided by Ruth’s Chris Steak House, click this link to make a $25 donation to The First Tee of Chattanooga in honor of your club staff. There is a place to write a personal thank you note, and the notes will be passed along to the appropriate folks. The staff that receives the most $25 donations in their honor will be treated to dinner at Ruth’s Chris Steak House at Hamilton Place. This is a great opportunity to say “thank you” to the staff that serves you, or to say thank you to one of the many staffs that serves us tournament players throughout each year by hosting our annual events such as the Signal Mountain Invitational, Brainerd Invitational, Ira Templeton Chattanooga, Open, Chattanooga Men’s Metro, Cleveland Invitational, and the season-ending Chattanooga TPC at Council Fire. Any one of these staffs is well deserving of the recognition. Pick your favorite event of the year and say “Thanks!” Because of the great sponsorship provided by Ruth’s Chris Steak House all proceeds benefit The First Tee of Chattanooga. P.S. If you prefer to send a check send $25 payable to The First Tee of Chattanooga, 2453 Hickory Valley Road, Chattanooga, TN 37421 with a note indicating which professional/staff you would like to recognize. Matt Crowder can’t remember the exact date, only that it was five or six years ago. But he remembers the score he shot the last time he played Council Fire. The occasion was a Tennessee Open qualifier. His score: A fat 96. As disappointing as that was, it led directly to his accomplishment the next time Crowder played Council Fire. Making 90 feet of putts on the final three holes, Crowder, who couldn’t break 80 in high school and gave up the game to play college baseball for two years, defeated Brandon Cissom, 1-up, in the finals of the Chattanooga TPC on Sunday. On paper, this would appear to be an upset of major proportions. Cissom is a former Lee University golfer who has won several times on the Chattanooga area amateur circuit, including the 2011 TPC. But a closer look reveals that Crowder had a pretty good 2013 season, and that his game is perfect for match play. Crowder earned his spot in the TPC with a 15th-place finish in the Cleveland Invitational, a 17th in the NGI and a 24th-place finish in the Tennessee Mid-Amateur, which in turn exempted him to the 2014 Mid-Amateur, which will be played in the TGA’s 100th anniversary year at The Honors. “That was my goal,” Crowder said. In his wildest dreams, Crowder, who has taken only one formal lesson in his life, might not have imagined he could win the TPC. Then again, his game is all about match play. He’s not a confident driver of the ball, but he can roll it. Cissom can attest to that. Cissom held a 1-up lead heading in the par-4 15th hole, but when he couldn’t get up and down from in front of the green and Crowder saved par from out of the greenside bunker with a 15-foot putt, the match was all square. On 16, another par-4, Cissom hit his approach to 20 feet. Crowder missed the green left and pitch to about 10 feet behind the hole. Cissom was impressed after Crowder rolled in his par putt, a speedy downhill white knuckler. Cissom seemed to regain control after Crowder’s tee shot at the par-3 17th went left down the hill and stopped two feet from the hazard. After watching that, Cissom hit safety to the middle of the green, about 25 feet from the hole. Crowder pitched his ball high and to the back of the green, and the ball caught the slope and rolled to within 20 feet for par. Yes, he made that putt, too. Cissom got Crowdered one more time on the par-5 18th. Crowder’s second shot landed in the greenside bunker, and his next barely cleared the lip and rolled only about three feet onto the green, leaving him a 60-footer for birdie. Cissom had a 25-footer for his four. Perhaps it was fitting that Crowder extracted his revenge on Council Fire by draining that 60 footer for birdie. When Cissom missed his putt, the tournament belonged to Crowder. When the putt rolled into the hole, Crowder couldn’t believe his good fortune. While most of the field in Chattanooga TPC stroke play qualifying struggled with the rough and Bermuda greens at Council Fire on Thursday, Neil Spitalny continued what he says is his best ball-striking year since his college golf days. Considering that Spitalny is 62 and he was an All-Big Ten player at Michigan, that’s saying something. Spitalny, who has qualified for the last five U.S. Senior Amateurs, could have played in the TPC proper or the senior division, but he decided to play with his peers and wound up as qualifying medalist with a par 72. The seniors played from a different set of tees than the rest of the field, but that was the low score of the day. Mitch Hufstetler, a staple in the TPC field, shot 73 to lead the other division. Taylor Lewis, a two-time winner of the Chattanooga Metro, shot 74. Though no official records are kept, tournament director Mike Jenkins and the staff at Council Fire, which has been home to the TPC for its 21-year existence, couldn’t remember a higher stroke average among qualifiers. The average score among the 22 players was 78.6. It took a couple of seasoned veterans to solve Council Fire’s rough and its quick greens. Hufstetler started strong with birdies on his first two holes and shot 1-under-35 on the front. He struggled a bit on the back, making bogeys at the par-4 10th, the par-4 16th and the par-5 18th, but his 73 was enough to claim the qualifying medal. He’ll square off on Friday against No. 16 seed Tim Crawford, who claimed his spot after a four-player-for-three-spots playoff. Spitalny endured a slow start after hitting his tee shot at the par-5 second hole out of bounds. “Playing safe with a 3-wood,” he said. He bogeyed the hole but gained that stroke back with a birdie at No. 7, a par 3. Most of Spitalny’s action on the back nine came in a three-hole stretch. He birdied the par-3 14th, bogeyed No. 15, a par-4, and came back with a birdie at No. 16. It doesn’t hurt if you’re good. Since overcoming a mysterious slump with his driver, Spitalny’s tee ball has been a weapon. Things got so bad Spitalny’s wife joked about sending him to a hypnotist. Tournament golf wasn’t any fun anymore. Then one day the problem disappeared. “I’m not sure how I worked myself out of it,” Spitalny said. He is sure how he shored up another key facet of his game. Even during his peak years, Spitalny could occasionally struggled with short putting. But after switching to a left-hand-low grip a couple of season ago, that problem went away, too. Spitalny will face three-time TPC winner Pat Corey on Friday. No. 2 seed Jim Chapin, who won the Senior Metro in July, plays two-time TPC winner Richard Keene in the other senior match. 77—Matt Crowder, Nick Blakely, Brandon Cissom. 78—Wayne Woolfall, Walt Moffitt, Joe Markham, Jr.
79—David Watts, Jimmy White III, Caleb Roberson, Tim Crawford. 83—Rusty Pickett, Bob Rice, Benjamin Thomas. 1:39 p.m.—No. 1 Mitch Hufstetler vs. No. 16 Tim Crawford; No. 8 Nick Blakely vs. No. 9 Matt Crowder. 1:48 p.m.—No. 4 Jay Potter vs. No. 13 Todd Moreland; No. 5 Matt Hadden vs. No. 12 Walt Moffitt. 1:57 p.m.—No. 2 Matt Roberson vs. No. 15 Jimmy White; No. 7 Brandon Cissom vs. No. 10 Wayne Woolfall. 2:06 p.m.—No. 3 Taylor Lewis vs. No. 14 Caleb Roberson; No. 6 Winston Brown vs. No. 11 Joe Markham. 1:30 p.m.—No.1 Neil Spitalny vs. No. 4 Pat Corey; No. 2 Jim Chapin vs. No. 3 Richard Keene.